It was just over a week ago that Andruw Jones had come off the disabled list to the tune of an 0-for-5 game with four strikeouts. At that time, we said there would only be brighter days ahead for Mr. Jones, and that it wouldn’t be long before “U” joined the Golden Sombrero Club. Well, no doubt about it — eight days later — I am proud to induct Andruw Jones into the LBS Golden Sombrero Club as the first position player to achieve the Platinum Sombrero. Honestly, this is quite the honor; I hope Andruw appreciates his company because it really is difficult to see at least 15 pitches in one night and not be able to touch at least one of them. I knew that we were heading for a magical night following Andruw’s second at-bat. He was so clueless at the plate, just waving at breaking balls in the dirt. Jones was so lost he would have punched out even with a tennis racket for a bat. And that’s not even an understatement. Seriously, if you missed it, Andruw looked like a 12-year-old kid at the plate who was seeing a curve ball for the first time. It was a pathetic joke. It’s no coincidence that Andruw struck out swinging every time up, against three different pitchers no less — they did their homework and realized the guy can’t touch a curveball. And what major leaguer doesn’t make an adjustment mid-game to try and hit a ball towards right field, or at the least, lay off a breaking ball in the dirt after the 15th time in one game? I am fully confident that I could have stepped out there last night and thrown three straight curves in the low-70s and struck Andruw out. I’m not even exaggerating because that’s how awful and clueless he was. This guy is so bad it’s now becoming fun to see just how bad he can get. He his hurting this team so much with his lack of production that its almost time to either shut the dude down for the year, or just outright release him and eat the salary. Dude is not going to turn it around this year, at least not without a road map and a compass. The Dodgers need a freaking hitter at the plate, not somebody who makes Angel Berroa look like Honus Wagner. 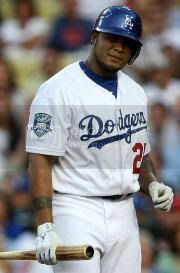 Oh yeah, and if the Dodgers have a charity auction, “A Day with Andruw Jones” would be the hottest commodity on the block if they ensure the winning bidder the opportunity to punch Jones in the face after he makes that stupid smile following a strikeout. Tell me you wouldn’t pay 10 grand to deck him after one of those smiles.